"UT/TT Poll: Abbott Leads Davis by Single Digits" was first published by The Texas Tribune, a nonprofit, nonpartisan media organization that informs Texans — and engages with them — about public policy, politics, government and statewide issues. Davis holds a lead over Pauken in a potential head-to-head race, according to the survey, getting 38 percent to his 34 percent, with 28 percent undecided. When Glass was added to that mix, Davis got 36 percent, Pauken 33 percent and Glass 6 percent, with 25 percent undecided. The number of respondents with no impression of Abbott, who launched his gubernatorial bid in July, shrunk to 18 percent from 31 percent in June. The spread between those with favorable impressions, now at 36 percent, and unfavorable ones, at 24 percent, remained about the same. The rise of Davis from June to October is evident in the sheer numbers of people who have an impression of her now: 37 percent have a favorable impression, while 24 percent have an unfavorable one. Only 16 percent said they have no opinion or don’t know of her. In the June survey, taken before her 11-hour filibuster of an omnibus abortion bill, 58 percent were in that last category, while 11 percent had favorable impressions and 12 percent had unfavorable ones. In the head-to-head race between the two, Davis is predictably ahead with Democrats, 67 percent to 8 percent, and Abbott is predictably ahead with Republicans, 74 percent to 6 percent. Independent registered voters were split 32 percent to 31 percent in favor of Abbott. “We’re so used to see the Republican gubernatorial candidate running from a position of incumbency,” Henson said. “Greg Abbott, while well-known, is not a household name. At least the race starts that way. That was evident before the rise of Wendy Davis, and it’s a stark contrast now that she has become so well-known in the wake of the filibuster. “This far out, there is always an element of these results that is about name recognition,” he said. In the second state race on the GOP primary ballot — for lieutenant governor — the UT/TT Poll found incumbent David Dewhurst in front, with 26 percent, but his rivals for the position combined for an anti-incumbent vote of 28 percent. State Sen. Dan Patrick had 13 percent, Land Commissioner Jerry Patterson had 10 percent and Agriculture Commissioner Todd Staples had 5 percent. Fewer Democratic candidates have announced plans to run for state office, and there were no Democratic primary contests to poll. • Nearly half of the Republican haven’t made up their minds in the primary for U.S. Senate. Incumbent John Cornyn got 39 percent, and two of his declared rivals — Dwayne Stovall and Erick Wyatt — combined to get 13 percent of the respondents. Linda Vega, who is also seeking the GOP nomination, entered the race after the poll was under way. Voters’ favorable impressions of Cornyn have slipped since June, dropping to 25 percent from 31 percent. The percentage with an unfavorable view, now at 30 percent, remained about the same, but a greater number of voters took a neutral position on that question. • The three-way Republican primary for attorney general is a statistical toss-up, with Railroad Commissioner Barry Smitherman at 11 percent, state Sen. Ken Paxton at 10 percent and state Rep. Dan Branch at 5 percent. The vast majority of Republican voters — 74 percent — remain undecided. • Undecided was the big winner in the Republican primary contest for comptroller of public accounts, too, with 75 percent. Debra Medina, the only candidate in the race who has run statewide before, got 14 percent, followed by former state Rep. Raul Torres of Corpus Christi at 5 percent, state Sen. Glenn Hegar of Katy at 4 percent and state Rep. Harvey Hilderbran of Kerrville at 2 percent. The University of Texas/Texas Tribune internet survey of 1,200 registered voters was conducted Oct. 18-27 and has an overall margin of error of +/- 3.3 percentage points. Results among self-identified Republican primary voters carry a margin of error of +/- 5.02 percentage points; among Democratic primary voters, +/- 6.03 percentage points. Numbers in the charts might not add up to 100 percent, because of rounding. This is one of six stories on the latest University of Texas/Texas Tribune Poll. Tomorrow: Ted Cruz and the 2016 presidential race. UT/TT Poll: Abbott Leads Davis by Single Digits By Ross Ramsey November 4, 2013 Attorney General Greg Abbott, the leading candidate for the Republican nomination for Texas governor, holds a single-digit lead over the likely Democratic nominee, state Sen. Wendy Davis of Fort Worth, according to the latest University of Texas/Texas Tribune Poll. In a head-to-head race, Abbott got 40 percent of registered voters to Davis’ 34 percent, with 25 percent of the voters undecided. In a three-way general election, he would get 40 percent, Davis would get 35 percent and Libertarian Kathie Glass would get 5 percent. “What you’ve got is a race in which, for the first time in a long time, the Democrat is as well-known as the Republican at the outset of the race,” said poll co-director Daron Shaw, a professor of government at the University of Texas at Austin. Enlarge Todd Wiseman “These numbers are not evidence that the underlying fundamentals are changing in Texas,” said Jim Henson, who co-directs the poll and heads the Texas Politics Project at UT-Austin. “We have not seen a big change in party identification, and we don’t see any large-scale shifts in the underlying attitudes that are forming.” Davis is the only Democrat in the race right now, but Abbott faces a five-candidate Republican primary. According to the poll, he would win that primary race handily: Half of the Republicans polled said they would vote for Abbott. His opponents — Lisa Fritsch, Tom Pauken, Miriam Martinez and Larry Kilgore — combined for only 8 percent, while 42 percent said they haven’t decided how they would vote in the GOP primary. Davis holds a lead over Pauken in a potential head-to-head race, according to the survey, getting 38 percent to his 34 percent, with 28 percent undecided. When Glass was added to that mix, Davis got 36 percent, Pauken 33 percent and Glass 6 percent, with 25 percent undecided. Enlarge Todd Wiseman “I’m a little surprised that Pauken is so nowhere,” Shaw said. 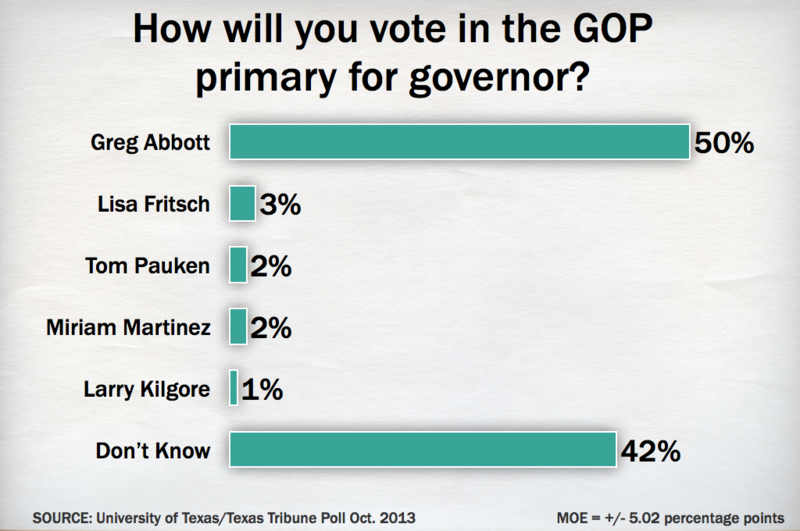 “I thought he would be the main challenger, and he may well be, but there’s nothing in the data to suggest that.” The number of respondents with no impression of Abbott, who launched his gubernatorial bid in July, shrunk to 18 percent from 31 percent in June. The spread between those with favorable impressions, now at 36 percent, and unfavorable ones, at 24 percent, remained about the same. The rise of Davis from June to October is evident in the sheer numbers of people who have an impression of her now: 37 percent have a favorable impression, while 24 percent have an unfavorable one. Only 16 percent said they have no opinion or don’t know of her. In the June survey, taken before her 11-hour filibuster of an omnibus abortion bill, 58 percent were in that last category, while 11 percent had favorable impressions and 12 percent had unfavorable ones. In the head-to-head race between the two, Davis is predictably ahead with Democrats, 67 percent to 8 percent, and Abbott is predictably ahead with Republicans, 74 percent to 6 percent. Independent registered voters were split 32 percent to 31 percent in favor of Abbott. “We’re so used to see the Republican gubernatorial candidate running from a position of incumbency,” Henson said. “Greg Abbott, while well-known, is not a household name. At least the race starts that way. That was evident before the rise of Wendy Davis, and it’s a stark contrast now that she has become so well-known in the wake of the filibuster. “This far out, there is always an element of these results that is about name recognition,” he said. Enlarge Todd Wiseman In the second state race on the GOP primary ballot — for lieutenant governor — the UT/TT Poll found incumbent David Dewhurst in front, with 26 percent, but his rivals for the position combined for an anti-incumbent vote of 28 percent. State Sen. Dan Patrick had 13 percent, Land Commissioner Jerry Patterson had 10 percent and Agriculture Commissioner Todd Staples had 5 percent. 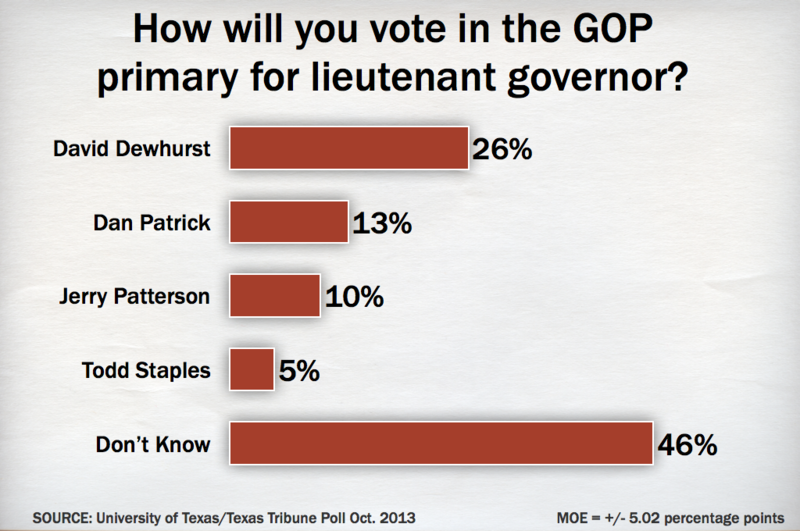 “Dewhurst has had a good month or so, and the others have not been able to get a lot of traction,” Shaw said. “A four-way race is a complicated thing. A candidate has to say, ‘Do I want to go after Dewhurst, which benefits the other two and hurts me because I went negative?’ Nobody really wants to do the dirty work of going after him, because they’ll get the damage of going negative.” Fewer Democratic candidates have announced plans to run for state office, and there were no Democratic primary contests to poll. In other 2014 statewide races: • Nearly half of the Republican haven’t made up their minds in the primary for U.S. Senate. Incumbent John Cornyn got 39 percent, and two of his declared rivals — Dwayne Stovall and Erick Wyatt — combined to get 13 percent of the respondents. Linda Vega, who is also seeking the GOP nomination, entered the race after the poll was under way. Voters’ favorable impressions of Cornyn have slipped since June, dropping to 25 percent from 31 percent. The percentage with an unfavorable view, now at 30 percent, remained about the same, but a greater number of voters took a neutral position on that question. • The three-way Republican primary for attorney general is a statistical toss-up, with Railroad Commissioner Barry Smitherman at 11 percent, state Sen. Ken Paxton at 10 percent and state Rep. Dan Branch at 5 percent. The vast majority of Republican voters — 74 percent — remain undecided. • Undecided was the big winner in the Republican primary contest for comptroller of public accounts, too, with 75 percent. Debra Medina, the only candidate in the race who has run statewide before, got 14 percent, followed by former state Rep. Raul Torres of Corpus Christi at 5 percent, state Sen. Glenn Hegar of Katy at 4 percent and state Rep. Harvey Hilderbran of Kerrville at 2 percent. The University of Texas/Texas Tribune internet survey of 1,200 registered voters was conducted Oct. 18-27 and has an overall margin of error of +/- 3.3 percentage points. Results among self-identified Republican primary voters carry a margin of error of +/- 5.02 percentage points; among Democratic primary voters, +/- 6.03 percentage points. Numbers in the charts might not add up to 100 percent, because of rounding. This is one of six stories on the latest University of Texas/Texas Tribune Poll. Tomorrow: Ted Cruz and the 2016 presidential race. Texas Tribune donors or members may be quoted or mentioned in our stories, or may be the subject of them. For a complete list of contributors, click here. Reference UT/TT Poll, October 2013: Summary, 2014 Races (150.2 KB) DOWNLOAD Reference UT/TT Poll, October 2013: Methodology (68.8 KB) DOWNLOAD "UT/TT Poll: Abbott Leads Davis by Single Digits" was first published at by The Texas Tribune, a nonprofit, nonpartisan media organization that informs Texans — and engages with them — about public policy, politics, government and statewide issues. 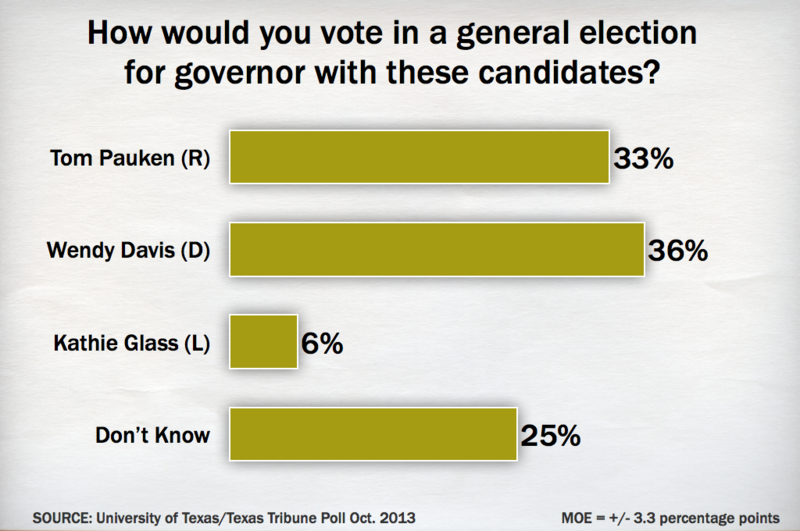 Link back to the original article, which is located at https://www.texastribune.org/2013/11/04/uttt-poll-governor-race-abbott-leads-davis-6/.